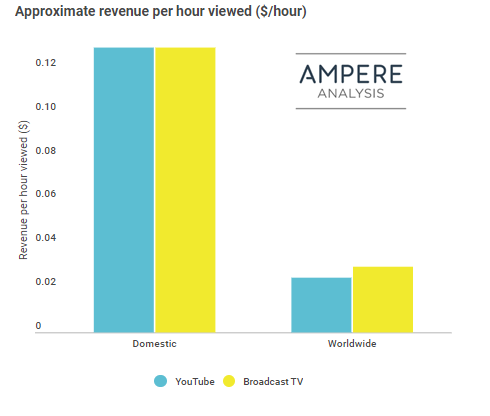 YouTube’s ad income for an hour of viewed content is now roughly equal to that of broadcast TV in markets like the US, though MCN valuations have “plummeted”, according to Ampere Analysis. The research firm said that YouTube has reached a “per-hour revenue ceiling” in some markets, claiming that this is a key factor influencing MCNs’ waning growth and valuations – as the monetisation opportunities aren’t there. 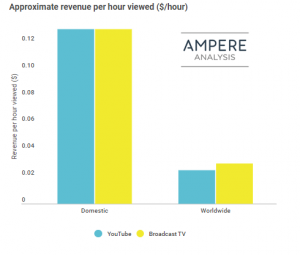 Ampere estimates that YouTube’s domestic per-hour-viewed revenue figure in line with the average for US broadcast, meaning that it may be “fast approaching the limits of its ability to grow per-stream revenue”. “As YouTube reaches parity per hour viewed with broadcast TV, MCNs valuations have plummeted. The market has experienced a complete reversal from 2014 when MCNs were changing hands for vast sums on the promise of future profit,” said Richard Broughton, director at Ampere Analysis.